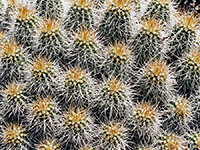 Agua Fria National Monument covers an area of high elevation desert around the boundary between the Sonoran cactus lands and the grass-chaparral belt, one third of the way from Phoenix to Flagstaff, alongside Interstate 17. The monument is only 10 by 20 miles in extent and like other relatively new preserves in Arizona such as Ironwood Forest there are few signs of its existence, just notice boards at the start of the three dirt tracks that cross into the area from the west. 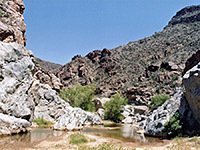 The centerpiece is the deep canyon of the Agua Fria River, which is bordered by two grassy mesas, split by various smaller valleys. As well as the protection of the abundant natural life sustained by the river corridor, the national monument was established to preserve hundreds of ancient sites - ruins, pictographs, petroglyphs - which are found dotted around the hills and along the river. Visitor activities include camping, bird watching, general exploration and in particular, hiking down the canyon. The main access to the national monument is from three I-17 exits (see map), one near the dispersed community of Cordes Lakes, the others - Bloody Basin Road and Badger Springs Road - in undeveloped areas. Apart from these, the only route in is from Black Canyon City in the south, where a track follows the Agua Fria River northwards for a few miles, though other approaches are possible from the east via rough roads through the Tonto and Prescott national forests. The northern section of Agua Fria National Monument contains 4,000 foot high Sycamore Mesa and several valleys but is mostly rather featureless, with low grassy hills bearing a few small bushes and occasional opuntia cacti. Such is the scenery around exit 262 of I-17, one of the three junctions which provide access to the monument. From here, a 2 mile drive through Cordes Lakes reaches the unpaved, lightly used but good quality 3M Ranch Road, which heads east across flat land for a short distance then veers northwards to the Agua Fria River, crossing it on a bridge. 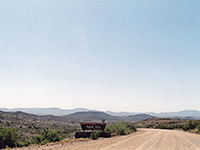 Just beyond are some old mine workings and one of several working ranches in the area, but most of the terrain ahead, around Sycamore Mesa, is accessible only by long cross-country hiking. The next interstate intersection to the south is the start of the most used route to the backcountry. From exit 259, another generally good gravel/dirt track (Bloody Basin Road) descends three miles to the river, then continues to more remote lands in the east, around Perry Mesa. There are plenty of fine primitive camping places along side tracks close to the interstate which allow for distant views south over the highway and the Agua Fria canyon. The land hereabouts has clumps of granitic boulders and coarse, clean white sand, quite similar to parts of Joshua Tree National Park in California. The main points of interest, on the east side of the river, are archaeological sites, the most publicized being Pueblo la Plata, a village that once contained nearly 100 rooms, though now only low, overgrown wall remnants are left. The trailhead is at the end of an unmarked side track to the north, 8.3 miles from the interstate. 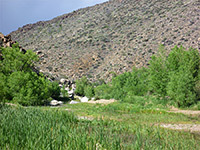 Other ruins hereabouts include the Baby Canyon Group and Pueblo Pato. From I-17 exit 256, a gravel/earth track leads east to a parking/camping area and a trail register, start of a 0.8 mile path down the mostly dry Badger Springs Canyon to the Agua Fria, meeting the river just as its canyon starts to deepen. Entries in the register suggest up to a dozen or so groups pass by each day in peak season. The river usually flows all year and forms pools several feet deep, many small waterfalls and pretty cascades, and although most people walk only to the end of the side ravine, the river canyon has no great obstacles and can be hiked in either direction. Lesser tracks near the interstate lead to other sites used for primitive camping; this is about the closest intersection to the greater Phoenix area where unspoilt desert lands are easily accessible. The nearest towns with hotels close to Agua Fria National Monument are Camp Verde and Prescott.